When the baby’s umbilical cord is wrapped around her neck, it is called a nuchal cord. A nuchal cord can occur during pregnancy, labor and delivery, and, if mismanaged, it can cause the baby to experience a lack of oxygen to her brain, called birth asphyxia. Birth asphyxia can cause hypoxic ischemic encephalopathy (HIE), periventricular leukomalacia (PVL – usually seen in premature babies), brain damage, and lifelong conditions such as cerebral palsy, a seizure disorder, intellectual disabilities, developmental delays, hydrocephalus and motor disorders. Babies born at term typically have HIE that involves damage in the basal ganglia and watershed areas of the brain. Often, medical malpractice plays a role in a baby having a birth injury. The medical team is supposed to continually monitor a baby’s heart rate throughout labor and delivery. When a baby is experiencing birth asphyxia, she will have nonreassuring heart tracings. The medical team must recognize these tracings and quickly deliver the baby, usually by emergency C-section. Failure to promptly deliver a baby who is in distress is negligence. If negligence causes the baby to have a birth injury such as cerebral palsy, it is medical malpractice. How Does a Cord Wrapped Around a Baby’s Neck Cause Birth Injury? When the umbilical cord wraps all the way around the baby’s neck, it is called a type A nuchal cord. A type B nuchal cord pattern occurs when the cord cannot be undone and ends up as a true knot. Nuchal cords may form at any time during pregnancy and then disentangle and possibly reform, or they may persist. In some cases, a nuchal cord may not affect pregnancy outcome significantly. In others, the nuchal cord may lead to restricted fetal blood flow (ischemia), decreased oxygen in the baby’s blood and tissues (hypoxia), decreased fetal development and movement, and complicated delivery. The umbilical cord is the baby’s lifeline. A baby’s only source of oxygen is oxygen-rich blood that comes from the mother. From the mother, the blood travels through the uteroplacental circulation, which is circulation through vessels that run through the womb and placenta. This blood then travels to the baby through a vein in the umbilical cord. If this umbilical vein becomes completely compressed, the baby will receive no oxygen and will just have to rely on the reserves in her body. If the umbilical vein becomes partially compressed, the baby will still experience oxygen deprivation; the more severe the compression, the worse the deprivation. In addition to cord compression, a nuchal cord can cause the baby to experience oxygen deprivation through other mechanisms. There is compression of the umbilical cord vessels themselves when the cord becomes tightly compressed against itself or the baby’s neck. This means that the umbilical vein that brings oxygen-rich blood to the baby is compressed. Also, the umbilical arteries that bring deoxygenated blood back from the baby to the mother are compressed. There is severe congestion of venous blood flow. This means that deoxygenated blood is backed up and is not able to travel back through the uteroplacental circulation to be exchanged with oxygen-rich blood from the mother. The blood that travels through a major vessel in the baby’s neck, called the carotid artery, becomes restricted because the umbilical cord is so tight around the baby’s neck. What Causes the Umbilical Cord to Wrap Around a Baby’s Neck? The formation of a nuchal cord may be a random event and/or it may be related to excessive fetal movement or a long umbilical cord. As the baby’s gestational age increases, so does the likelihood of a nuchal cord. Moniamniotic twins (twins that share the same amniotic sac) always have some degree of cord entanglement. A twin’s own cord can become wrapped around her neck and it can also become wrapped around her twin’s neck. The baby has a long umbilical cord. There is too much amniotic fluid surrounding the baby (hydramnios). The baby is large for gestational age (LGA). The mother is carrying multiple babies. There are nutritional deficiencies that affect the structure and protective barrier of the cord. The baby presents abnormally during birth, such as in a breech or shoulder first position. 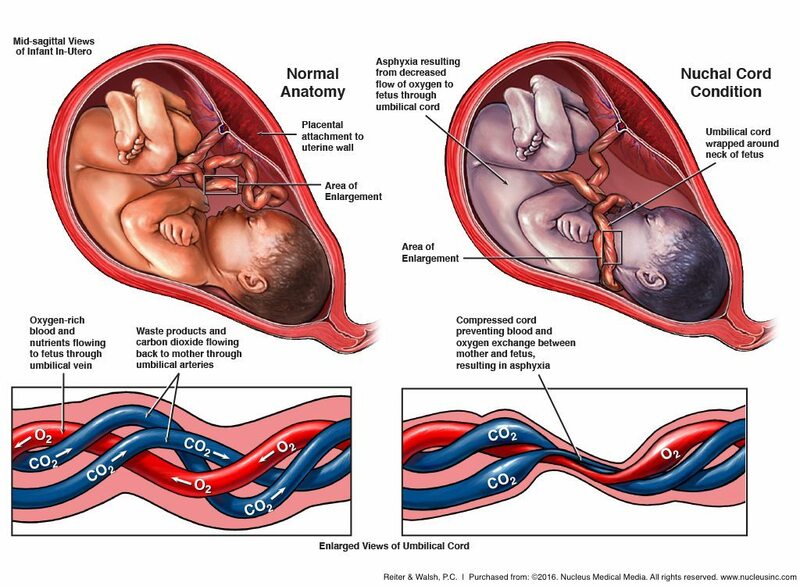 A nuchal cord can cause severe birth asphyxia, especially if the cord is tight around the neck, is wrapped around the neck more than once, or where low amniotic fluid causes cord compression. Other potential umbilical cord complications from a nuchal cord include umbilical cord prolapse (when the umbilical cord slips ahead of the baby in the birth canal) and vasa previa (when an umbilical cord blood vessel crosses the cervix under the baby and is torn). In these circumstances, the baby may experience fetal distress due to decreased oxygen and blood flow. Many times, fetal distress is marked by accelerations or decelerations on the fetal monitor, called non-reassuring heart tracings. Nuchal cords may be diagnosed during an obstetrical ultrasound. To identify a nuchal cord, physicians look at multiple views of the fetal neck. A nuchal cord is diagnosed when the umbilical cord is visualized encircling at least three-quarters of the fetal neck. If the cord is seen encircling at least half of the neck, it may be classified as suspicious for the presence of a nuchal cord. Color Doppler can identify 83% – 97% of nuchal cords. The most common sign of a nuchal cord is decreased fetal activity after week 37. If a knot occurs during labor, the fetal monitor will show a non-reassuring heart tracing. When a baby has a nuchal cord, the main goal is to prevent cord compression during delivery. Physicians may try to deliver the baby vaginally, using different techniques to remove pressure on the umbilical cord. However, research shows that handling and stretching the cord can cause decreased blood flow to the baby. Thus, a C-section delivery may be the safest way to deliver a baby who has a nuchal cord and a non-reassuring heart tracing. As with any delivery, if the baby shows any signs of distress, an emergency C-section should be performed immediately, in most cases. If your child was diagnosed with a birth injury, such as cerebral palsy, a seizure disorder or hypoxic ischemic encephalopathy (HIE), the award winning birth injury lawyers at ABC Law Centers can help. We have helped children throughout the country obtain compensation for lifelong treatment, therapy and a secure future, and we give personal attention to each child and family we represent. Our nationally recognized birth injury firm has numerous multi-million dollar verdicts and settlements that attest to our success and no fees are ever paid to our firm until we win your case. Email or call Reiter & Walsh ABC Law Centers at 888-419-2229 for a free case evaluation. Our firm’s award winning medical malpractice lawyers are available 24 / 7 to speak with you. Nelson KB, Grether JK. Potentially asphyxiating conditions and spastic cerebral palsy in infants of normal birth weight. Am J Obstet Gynecol 1998; 179:507. Verdel MJ, Exalto N. Tight nuchal coiling of the umbilical cord causing fetal death. J Clin Ultrasound 1994; 22:64. Dhar KK, Ray SN, Dhall GI. Significance of nuchal cord. J Indian Med Assoc 1995; 93:451. Collins JH. Nuchal cord type A and type B. Am J Obstet Gynecol 1997; 177:94. Jauniaux, E., Ramsay, B., Peellaerts, C., & Scholler, Y. (2008). Perinatal features of pregnancies complicated by nuchal cord. American journal of perinatology, 12(04), 255-258. Zahoor, Farnaz, Zakia Minhas, and Adil Zaki. “PERINATAL OUTCOME OF NUCHAL CORD.” Journal of Postgraduate Medical Institute (Peshawar-Pakistan) 27.2 (2013).